We see this every day at Sugar Fix. Patients come in that had braces before, but never received a retainer. Another patient would have had a retainer, but the lower lingual bar that was placed ten years ago has popped off. Slowly, but surely those little lower teeth find there way back to being misaligned and crowded. The issue with this relapse is, with the teeth crossing over each other, it is very hard to keep the lower teeth clean. The tarter and staining on the back part of the lower teeth build up here the fastest in between cleaning appointments. There is an amazing quick fix to this with Invisalign 10. Invisalign recently added this treatment to help with patients who do not need a full case, but minor movements in a short time period. 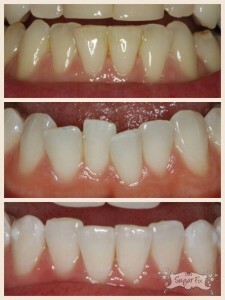 The Invisalign 10, or Invisalign express, is a quick process with great results. All of our patients who are currently in treatment or have just started are very excited and are wondering why they haven’t fixed their crowding sooner. The aesthetics of your teeth being in proper alignment is just an added bonus. I mean, who doesn’t want straighter looking teeth!? It is a great 2 in 1 deal! With this Invisalign program, there are ten aligners included to correct the crowding on the lower teeth. It also can align anything that has moved on the upper as well. This treatment is a short 5 months. After you have the full Invisalign treatment, this time will seem to have flown by. At our office, a final lower tray is included with your Invisalign case so there is no further relapse. At every cleaning appointment we can professionally clean your trays too! If you or any one you know has interest in Invisalign please reach out to us with any questions or if you would like to schedule an appointment.